A Gayle Force: Hey! I went to Seattle! Hey! I went to Seattle! I realize I've been slacking reaaaalllll hard here lately. I'm not even sorry. Things are busy. Maybe eventually I'll forreal update you on what's been going on. But for now, just know that three out-of-town trips in less than three weeks is a friggin lot. Last week Erich and I flew to Seattle. A lot happened in the three short days we were there, and we flew back on a red eye and I'm exhausted because I haven't totally caught up on the time change, so I'm just gonna photo-dump my trip. Enjoy! Oh, there are SO many other (better) pictures on my real camera, but aintnobodygottimeforthat. So this is what you get. -Erich freaked out because there was a real starfish just chillin' in the water, so I took a picture. -This is what downtown near the water looks like. Cool ferris wheel. -Best calamari of my whole life. -The original Starbucks. We did not go in. -The fish place at Pike's Place Market. They actually threw fish. It was awesome. -Inside the space needle there's a wall of information. Apparently it was thought up by this guy (Edwin Carlson) and the originial plan was drawn on a napkin. 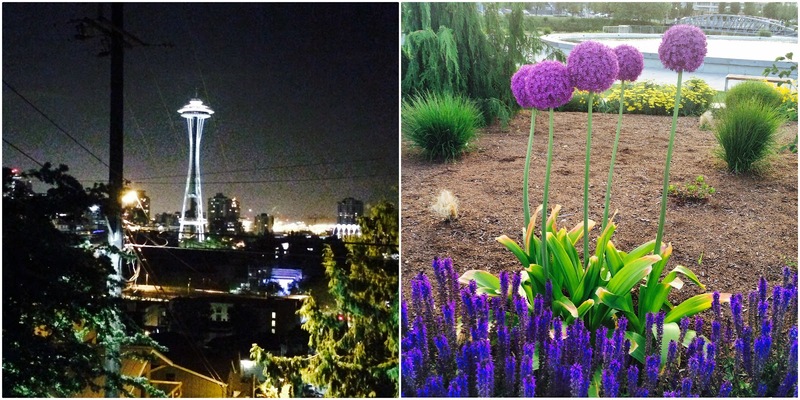 -Night view of the Space Needle from the Queen Anne neighborhood. Beautiful. -Allium flowers by Lake Union. This was my happy place. I could have spent the whole day there (if I had a jacket, blanket, bonfire, and hat). Not pictured from Wednesday: The best pizza I ever ate, made with mozz from a water buffalo. Yeah, I'll let that sink in. -We went to the zoo, and I'm very happy to say there were giraffes. I got to feed one and it licked me. I squealed like a toddler and I don't even care. I'm still excited about it. -This is Seattle's idea of a beach. It was about 60 degrees and people were in bathing suits! Also, it's hard to see, but there are mountains in the background. A beach with mountains. I can't. Not pictured from Thursday: Everything. If I ever stop being so lazy I'll come back and add the good pictures because there are tons. But this should pretty much give you an idea of Seattle and the kind of trip I had.